The combination of an intense curiosity and the possibility of new ideas has led artist and photographer Dan Holdsworth to mine the infinite depths of glaciers and map the contours of some of the world’s highest mountains in his new exhibition, Continuous Topography, at Sunderland’s NGCA. 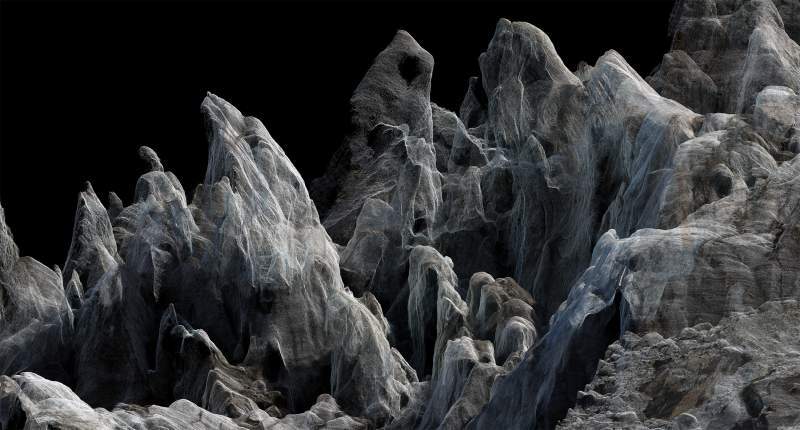 The artist’s first moving image work uses cutting-edge photography techniques to produce animations of glacial Alpine landscapes, resulting in an alien and otherworldly view. Working alongside the geology department at Northumbria University, Dan joined geology PhD student Mark Allan on several trips to the French and Swiss Alps to make photographic aerial surveys of mountains and glaciers using helicopters and drones. “The process called ‘photogrammetry’ involves making a photographic survey of an area, taking hundreds of images. These photographs are then processed to created 3D models of the landscape and then I work with the models back in the studio to create the artworks, still and moving images.” He explains. The resulting animations have taken five years of painstaking work, with Dan spending seven weeks hiking around Mont Blanc’s glaciers in the Chamonix valley. “We created an enormous amount of data from these expeditions and I have been working with this since then to create the works you see in Continuous Topography.” The imagery produced is remarkably detailed; jagged serrations in the earth are rendered in minute detail, with fluid, graceful waves depicting the flow of water over countless aeons. Continuous Topography is at NGCA, Sunderland from Friday 26th October until Sunday 6th January.